See which active adult communities were the best-selling in the nation. For the third year in a row, 55places.com is excited to announce its list of best-selling active adult communities from across the country. 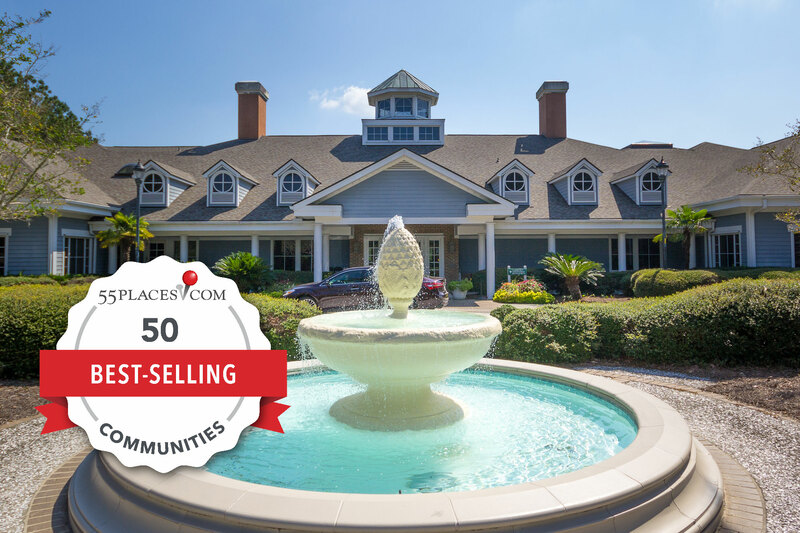 We’ve compiled this list of the best-selling 55+ communities based on the number of sales through 55places.com in the last twelve months, from March 1st of 2017 to February 28th of 2018. This list is based on sales made through our website and does not represent overall sales in any given community. To learn more about our criteria breakdown and methodology, click here. With a wide selection of active adult communities from coast to coast, retirees now have more options than ever when choosing their perfect 55+ community. These active adult communities come in all kinds of styles and sizes and offer a variety of home designs and amenities in exciting locations that appeal to the diverse lifestyles of retirees. Although the list of active adult communities is long and the communities represented here are found in various cities and regions across the U.S., it appears that our top selling 55-plus communities are located in warm climate states, which seems to be a favorite among our active adult crowd. Check out which active adult communities made our best selling list for 2018. Del Webb’s award-winning 55+ community in Coastal South Carolina earned the top spot on our best-selling list for the third time. Sun City Hilton Head attracts a large active adult crowd because of its reasonably priced homes, exciting social environment, and prime location in Bluffton, South Carolina. The community also supports an active lifestyle thanks to its 54 holes of golf and 45-acre Village Center that’s filled with a rich lineup of amenities and recreational facilities. This active adult community boasts more than 200 clubs and activities that cater to a variety of interests, ranging from ballroom dancing and bowling leagues to motorcycle clubs and ceramics classes. “Moving to Sun City Hilton Head has been a dream come true - we are kicking ourselves for not moving sooner. The clubhouse, pools, fitness centers, clubs, and organized activities are even better than we thought!” said Kathy J., a resident of Sun City Hilton Head. Although not age-restricted, Brunswick Forest in Leland, North Carolina attracts the 55+ crowd because of its active lifestyle, vast wooded landscape, and picturesque coastal environment. In addition to the vibrant atmosphere, residents also enjoy an 18-hole championship golf course, tennis courts, and world-class amenities found at its 18,000 square-foot clubhouse where there are plenty of activities, events, and recreation to keep them happy, healthy, and entertained. “When I go by the wellness center I see activity. When I say ‘activity’ I mean movement. I see people participating in yoga, Pilates, pickleball, tennis, exercise….and yes, cards. This is, in every [essence] of the word, a very ‘active’ community,” said Christopher Creekmore, 55places.com Partner Agent. Brunswick Forest’s prime location in Coastal North Carolina also allows residents to enjoy the beautiful outdoor environment thanks to the community’s small boat launch facility located near Cape Fear River and the Intracoastal Waterway as well as big-city entertainment in nearby Wilmington. “The community of Brunswick Forest is just what we desired, great homes at great value, friendly neighbors, and lots of activities for residents. The Wilmington area seems to offer all the amenities needed or wanted without the...cold weather nor the Florida heat and endless palm trees,” said Jon C., a homeowner in Brunswick Forest. Another Del Webb 55-plus community making the top-selling list is Sun City Texas in Georgetown, TX. This active adult community is famous for its small-town charm and elegant homes carved into the Texas Hill Country. Retirees can find a tranquil and laid-back setting while also enjoying a vibrant social scene thanks to the community’s world-class amenities and a long list of activities. “Great community with every activity you can think of doing. They do a great job of helping new residents get integrated into activities of interest as well as meeting residents. This community is like living in a resort but even more friendly. Moving here was absolutely the best decision we could have made for retirement living,” said Ken K., a Sun City Texas resident. Sun City Texas is spread across 5,300 acres and consists of 9,900 homes, making it the largest age-restricted community in the state of Texas. Boomers also flock to Sun City Texas because of its close proximity to Austin, which is just 35 miles away and offers additional culture, entertainment, and big-city attractions. “This is not a bad place to live and start your new adventure, while you spend the rest of your life trying to figure out where you want to go," said Kerry Hamman, a 55places.com Partner Agent. Florida has always been a popular retirement destination, so it’s no surprise that one of the top-selling active adult communities is On Top of the World in Ocala, Florida. This 55+ community is known for its vast amenities that are scattered across acres of lush landscaping. Some of its notable amenities include an R/C airplane field, three golf courses, several clubhouses, multiple fitness centers, and swimming pools, and a lifelong learning center. “Pretty amazing place to live. There are tons of clubs and events going on all the time. This place will keep you busy! What a great place to live” said Matt S., a resident of On Top of the World. With plans to build 10,000 homes, retirees will also find a variety of unique floor plans that cater to many tastes and budgets. Ideally situated in the heart of Central Florida, On Top of the World also features easy access to nearby necessities like grocery stores, a post office, restaurants, retail shops, and banks, all accessible via golf carts. “Just golf cart rides around the neighborhoods brings much enjoyment,” said Tom & Kathy, residents of On Top of the World. Kings Point is an established 55+ community in Sun City Center, Florida and has just over 5,200 homes. Kings Point has been a top-selling active adult community thanks to its affordable homes as well as its diverse lineup of resort-style amenities found in the 97,000 square-foot Kings Point Clubhouse. Residents also love the convenient golf cart access that lets them get around the neighborhood easily as well as nearby retail and dining establishments. “Being able to drive your golf cart all over the place is an added bonus! You have to come to see it all for yourself,” said Darlene and Rich Bombardier, homeowners in Kings Point. In addition to quality homes, superb amenities, and golf cart lanes throughout the development, homeowners also enjoy the community’s central location in the Tampa Bay Area. Residents are just 25 miles south of Tampa and the community is surrounded by plenty of attractions such as shopping centers, beautiful beaches, golf courses, and entertainment. “Wonderful place to live in the heart of shopping areas, filled with amenities – something for everyone!” said Laura C., a resident of Kings Point.